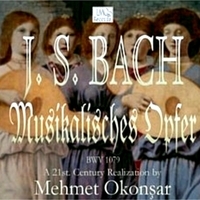 The Musical Offering (German title: Musikalisches Opfer or Das Musikalische Opfer), BWV 1079, is a collection of keyboard canons and fugues and other pieces of music by Johann Sebastian Bach, all based on a single musical theme given to him by Frederick the Great (Frederick II of Prussia), to whom they are dedicated. The Ricercar a 6, a six-voice fugue which is the highpoint of the entire work, was put forward by the musicologist Charles Rosen as the most significant piano composition in history (partly because it is one of the first). This ricercar is also occasionally called the Prussian Fugue, a name used by Bach himself.